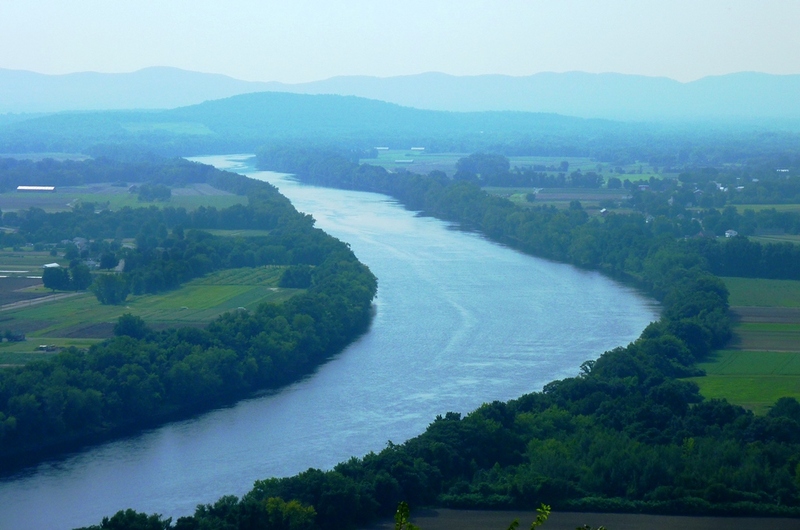 View of the Connecticut River Valley from Mt. Sugarloaf State Reservation in South Deerfield, Mass. 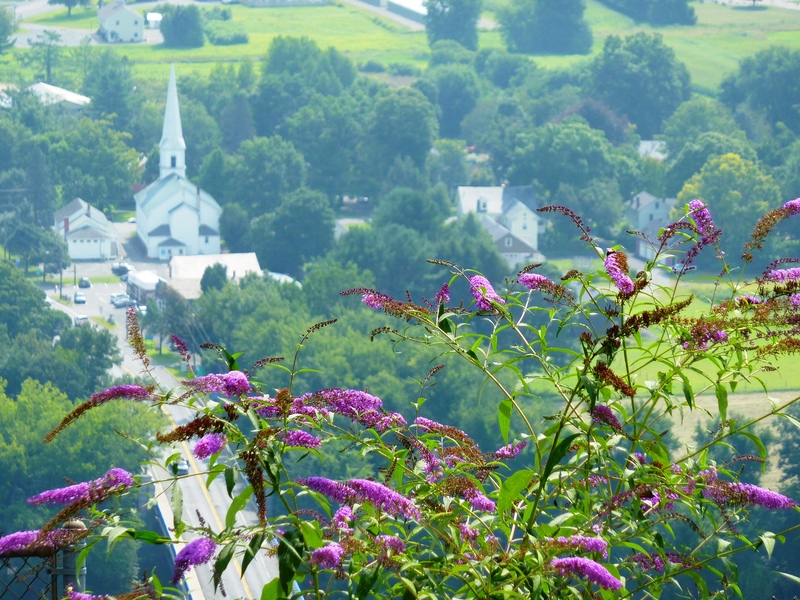 The Berkshire Mountains of Western Massachusetts receive a lot of travel attention and rightfully so — the mountains, rolling hills, lakes, picture-perfect towns and plenty of culture make for appealing destinations. The Berkshires’ popularity, however, takes away from some other nearby areas that, in their own right, offer peaceful, scenic and interesting areas that should be explored, also. 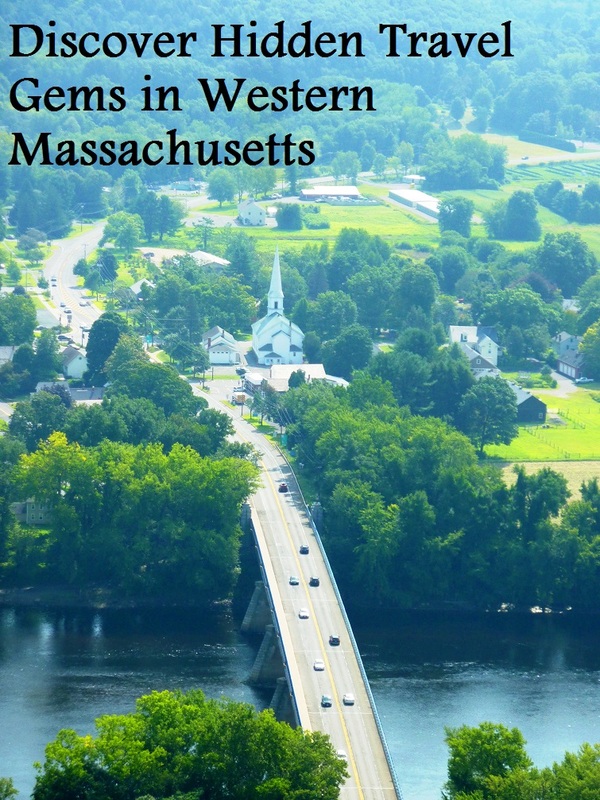 Hampden, Hampshire and Franklin Counties feature many destinations that rank amongst the best in New England travel and often without the tourist hype that impedes the overall experience. Bruuer Pond at Sevey Park in Wilbraham, Mass. Main Street in Wilbraham (Hampden County) feels like a safe place sheltered from a busier world only 10 minutes away in Springfield. The historic homes with big front lawns, the Village Store Cafe with old-timers eating and chatting on the front porch, residents out for a quiet morning walk, the Old Meeting House (now a museum of local history) with flag buntings draped over the Colonial white home structure, and the stately Wilbraham and Monson Academy help comprise what feels like one of the most underrated, unassuming small towns in western Massachusetts. Other than paved roadways, it probably doesn’t look much different in Wilbraham center than 125 years ago. What most caught my attention, however: Bruuer Pond at Sevey Park with its deep green grass, picnic tables and a nice little pond. 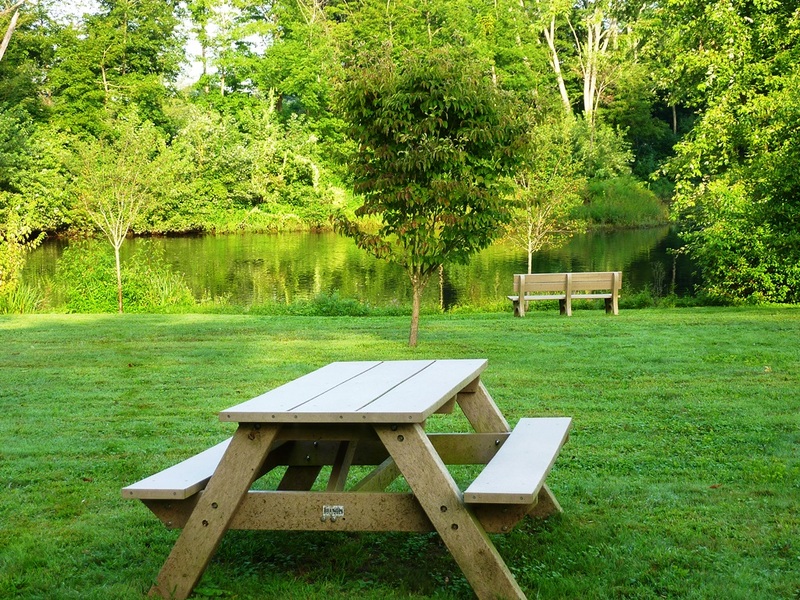 Sure, most communities have something like Sevey Park but in the context of a beautiful small town like Wilbraham, this kind of park seems even more special. On this morning, you could hear that proverbial pin drop with the sounds of birds overtaking any traffic sounds on Main St. Sometimes, all you need is a peaceful place to sit and a scenic pond. Upon entering the center of South Hadley (Hampshire County) begs the question: Why can’t more small town downtown districts look like this in the 21st century? 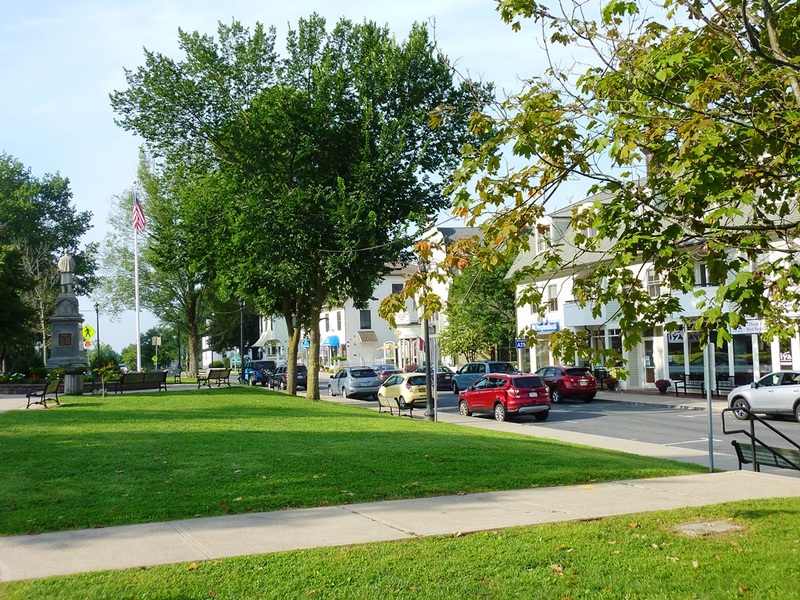 Quaint, historic, serviceable, tree-lined and well-maintained, everything comes together in a way that should serve as the prototype of what a small downtown should look like in New England. 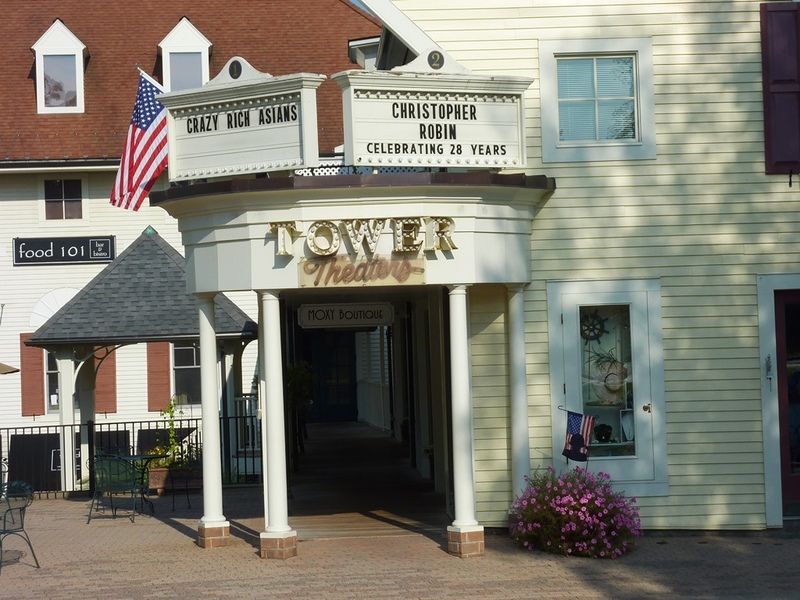 On one hand, you have a mix of businesses most everyone wants to see in their own small towns — bookstore, indie movie theater, a tavern, breakfast and deli spot with outdoor seating, frozen yogurt, art galleries and boutiques. On the other hand, old churches, historic municipal buildings, a lovely town common and the presence of Mt. 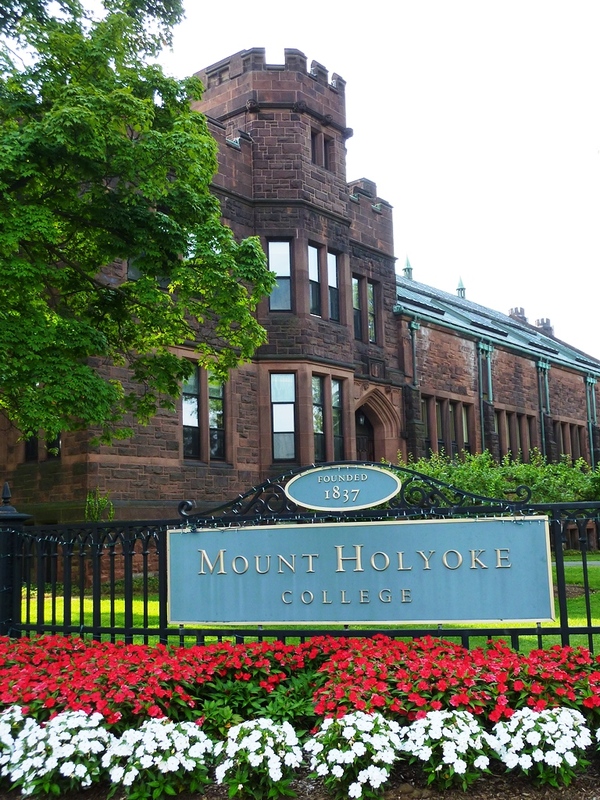 Holyoke College (a women’s college established in 1837), visually provide a reminder of the old New England, which by the way, never gets old in the eyes of a local New Englander. Mt. Holyoke College in South Hadley, Mass. Downtown South Hadley also offers some culture, most notably the Mount Holyoke College Art Museum on Lower Lake Rd. with more than 400 works of art from around the world, It is one of the oldest collegiate art museums in the country, dating back to 1876. South Hadley center might be small, but comes up big-time as a reminder of what downtowns used to offer before strip malls and chain stores took over. Kudos to the community and its small businesses owners for allowing the downtown to reach its full potential! Barstow’s Dairy Store and Bakery in Hadley, Mass. 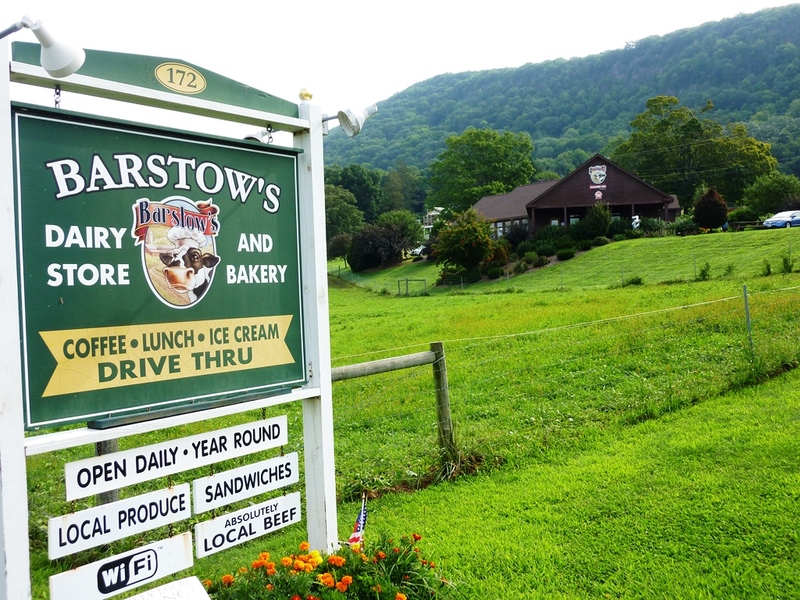 Barstow’s Dairy Store and Bakery at Longview Farm on 172 Hockanum Rd. in Hadley (Hampshire County) offers a rural setting that feels simultaneously idyllic and relaxing with its expansive farm land, cows in the field, scenic hills and quietness –the latter that reminds us how noisy and city and suburbs can be in comparison. Outdoor dining area at Barstow’s Dairy Store and Bakery in Hadley, Mass. 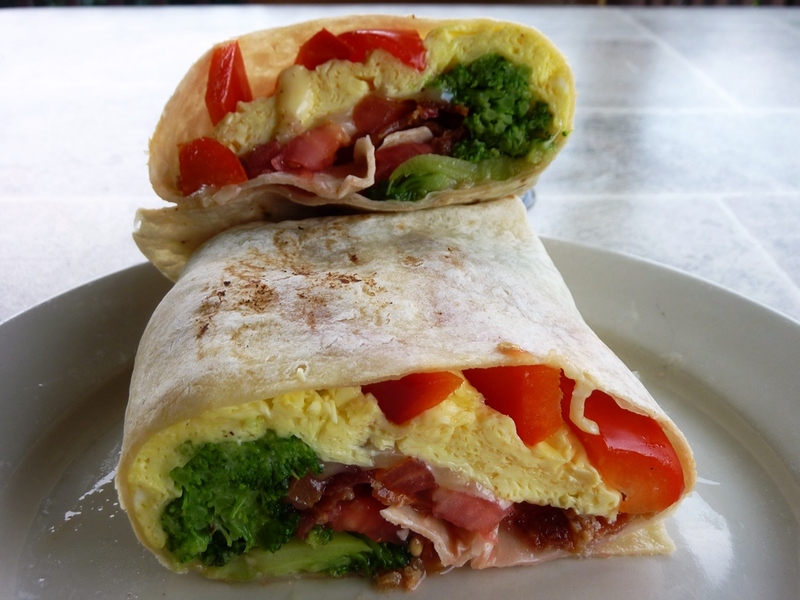 Egg and cheese breakfast burrito with broccoli, bacon and red peppers from Barstow’s Dairy Store and Bakery in Hadley, Mass. Cows working hard at Barstow’s Longview Farm in Hadley, Mass. Spectacular view from Sugarloaf Mountain in South Deerfield, Mass. For the short car ride up or the moderately challenging hike, Mt. 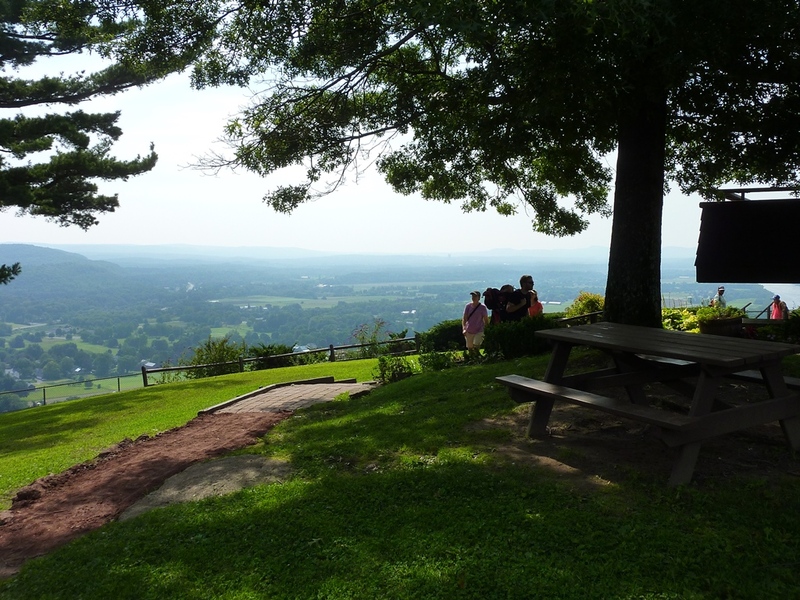 Sugarloaf Reservation at 300 Mt. Sugarloaf St. in South Deerfield (Franklin County) affords some incredible views of the Connecticut River, the valley and quaint neighborhoods (at least that’s the way it looks from high above). Village view from the top of Mount Sugarloaf State Reservation in South Deerfield, Mass. You could hike for hours at some mountains in New Hampshire and not get this kind of unobstructed view. What a perfect place for hiking, picnics (they have grills and a pavilion) and mountain biking! Massachusetts residents pay just $5 and non residents $10 to access million dollar views. For more information, log onto the Massachusetts Department of Conservation and Recreation web site. 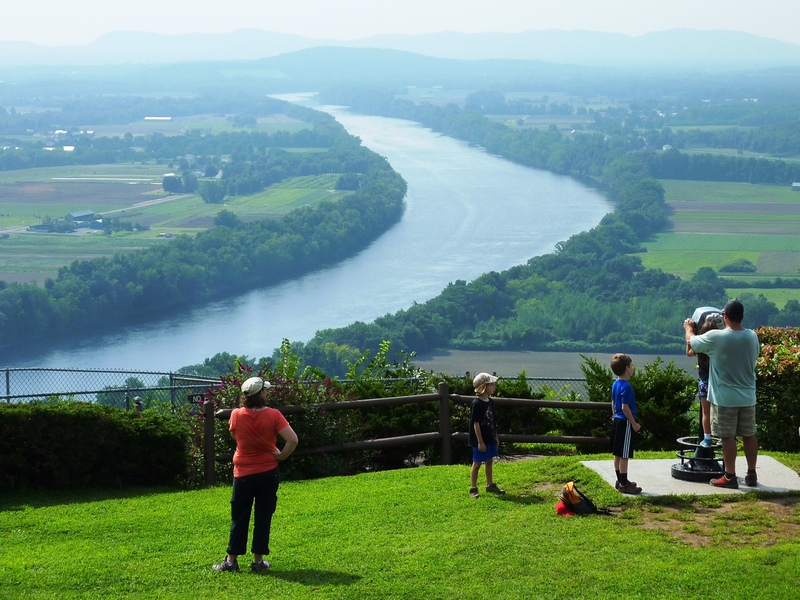 View of the Connecticut River from Sugarloaf Mountain in South Deerfield, Mass. Sometimes employing spontaneity and rejecting paint-by-numbers generic travel guides yields the most rewarding experiences. The instant memories made for a morning trip that cost about $10 just shows that sometimes the simplest things in life can happen in places you wouldn’t expect. From virtually your own backyard to regions that might not be household travel names, the opportunities exist to create your own special day trips. Hampden, Hampshire and Franklin counties certainly afford myriad travel destinations to call your own. If going there, feel free to drop me a few comments in this post on your experiences in these beautiful counties! Attention small business owners in Hampden, Franklin and Hampshire counties: Please consider having your business permanently featured on VisitingNewEngland for a low one-time fee. Please take a look at some of the businesses I have passionately written about. You get great visibility while helping support my business!